Like rivers, books can take time to reach their destinations. Published in 2012 after years in the making, Passion for Place—a compendium of art, essays, and interviews—is finding a niche close to the river that inspired it. Paola Fiorelle Berthoin, the editor and driving force behind the book, is taking the book this August, September, and October, along with her own paintings and photographs, to events around Monterey County. The literary Carmelites Mary Austin and George Sterling, who lived in the watershed a hundred years ago, would likely join the festivities if they were around today. So would their summer guests, Jack and Charmian London, who often visited from Sonoma. Jack London raved about Carmel; he’d probably rave about Passion for Place. Like his best books, it takes readers on a journey, in this case inland, upstream, and into a watershed. The product of grass roots creativity, the coffee-table book offers short stories, poems, sketches, essays, and a CD, plus color paintings and photographs by Berthoin, an Englishwoman who arrived in Carmel in 1965 and has never taken her eyes off the place. In more than 50 dazzling oil paintings, including “View from Carmel Valley Road,” she transforms familiar scenes into magical landscapes with bold, bright colors. Her “Storm Clouds, Los Laureles Grade” conjures an ominous scene that the Big Sur poet, Robinson Jeffers, might have depicted in blank verse. In the foreword, Freeman House— author of Totem Salmon, a classic about Humboldt’s Mattole River—distinguishes between denizens linked to the land and citizens connected to cities. He suggests that Californians might want to define themselves as inhabitants of watersheds rather than urban or suburban neighborhoods. In “How I’m Taught Green,” Barbara Mossberg plunges into the vegetation around the river. “It could be a weed, wild, /How it grows by the river, free,/Unplanted by any human hand—a dart of random green,” she writes. Pam Krone-Davis aims to think and feel like a steelhead trout. “When I first hatched from the nest my mother had made in the small stones with her tail, I was very small,” she writes. Mark Stromberg keep track of the animals in and around the river, including a ring-tailed cat that looks in the artist’s rendition like a creature from Lewis Carroll’s Alice in Wonderland. Stromberg and fellow denizens depict the watershed as a wonderland to explore and protect—and as an expensive one, too. Inhabiting a beautiful watershed, Stromberg points out, comes with a price tag these days, in more ways than one. At its best, Passion for Place creates a strong sense of a singular environment that is sacred to Native Americans and beloved by landscape painters such as Berthoin. Moreover, the book could serve as a guide for artists and writers who might want to explore, portray, and work to save California’s endangered watersheds, from the Sierra Nevada to the Pacific, and from urban and suburban neighborhoods to rural farmlands. Jonah Raskin is the author of Natives, Newcomers, Exiles, Fugitives: Northern California Writers and their Work and a frequent contributor to Boom. On August 29, Berthoin will read from Passion for Place at Caraccioli Cellars in Carmel. Pilgrim’s Way Bookstore co-sponsors the event. 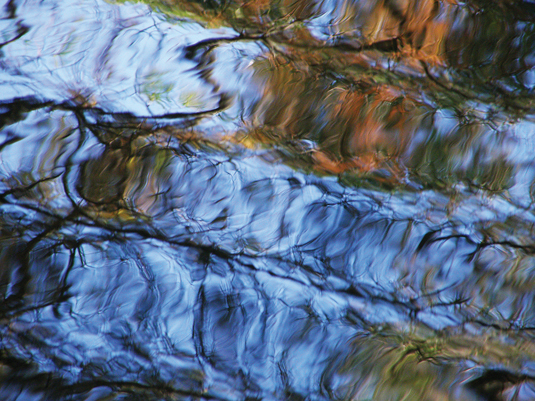 On September 21, the autumn equinox, Berthoin, friends, neighbors, and fellow ecologists commemorate World Rivers Day. On September 28 and 29, Berthoin joins the annual Monterey County Artist Studio Tour with an exhibit of her landscape paintings at 15 Scarlett Road, a studio in Carmel Valley. On October 13, at the popular Carmel River Festival and Feast, sponsored by the Carmel River Watershed Council, the Carmel River Steelhead Association, and the Carmel Valley Association, Berthoin is coordinator for the plein air painting show and competition for regional artists. On her website--www.passion4place.net—Berthoin posts up-to-date information about events. Passion for Place featured in Off 68, the Salinas Californian weekly paper mailed to 7,000 homeowners. The inspiration for a major artistic project often comes when one least expects it. For artist Paola Fiorelle Berthoin, that pivotal moment came while she was working on a painting in a dry segment of the Carmel River. Berthoin and some friends had been thinking about doing a book focusing on the river and the importance of the watershed, but the idea had stagnated a bit, like some of the pools of water around her. On this day, the Carmel Valley resident said she decided it was time to move forward and launch the project. The fruits of that decision and Berthoin’s determination to make an “interesting idea” a reality is a book titled “Passion for Place: Community Reflections of the Carmel River Watershed,” which was released late last year. How the book’s editor went from wanting to do a work of this nature to seeing it actually become a reality is a meandering story that resembles the winding course of the river the volume celebrates with art, poetry and personal narratives. Born in England, Berthoin relocated to the Carmel Valley when she was four years old. She attended local schools and studied printmaking at what is now the California College of the Arts in Oakland. With a BA in fine arts in hand, Berthoin returned to the Central Coast, where she opened a restaurant in the valley with her mother and pursued her art career. Berthoin became politically involved with watershed awareness when, in the late 1980s, the Hatton Canyon freeway controversy was drawing in many community members. “Because of where I live I have always been interested in watershed issues and I was always looking for ways of using my art background to educate people,” Berthoin said. The artist created the Hatton Canyon Arts marathon, where individuals painted in the canyon for a week to raise the public’s consciousness about the area’s natural beauty and then their works were displayed at the Carmel Crossroads. Next, in the late 1990s, Berthoin served on the Carmel River Watershed Council, which brought together stakeholders from throughout the river’s watershed. She represented the education/spiritual/cultural stakeholders. Since she was also involved in arts education at the time, Berthoin created a Watershed Arts curriculum that she taught in local schools, and she was also involved in creating educational boards about the watershed that were placed in Garland Park. All of these activities were the “precursors” to the book. The book discussion began in 2004 when Berthoin was serving as the group’s board president. The following year she took a break and the book idea was put on the back burner. John Dotson, Peter Moras and Marliee Childs were part of the original group that discussed what shape the book should take. In 2009 Berthoin decided it was time to resurrect the idea and move ahead. At that point she decided to do it on her own. Acting as editor in tandem with Dotson and Laura Bayless, Berthoin began contacting people whom she hoped would contribute poetry or personal narratives about the Carmel River watershed. Ultimately more than 35 people provided textual material for the volume. The process took about two years. Berthoin provided the color paintings and photos featured in the book, while Anne Greene and Pamela Takigawa created many of the line drawings. Since some people were not comfortable sharing their thoughts in written form, Berthoin did interviews with eight people and created a CD of excerpts from the conversations, which is included with the book. When it came to finding a publisher, Berthoin decided it made more sense to publish the book herself, thus maintaining full control of the editing process. She used a local printer in Watsonville and defrayed some of the expense through a fundraising campaign. The initial response to “Passion for Place” has been very positive. The book’s editor said through book signings and other community events she has sold nearly half of the initial press run of 1,000 copies. Last month, Berthoin was delighted to learn that the book was awarded a bronze medal in the Independent Publishers Competition for the Best Regional Non-fiction book for the West Pacific Region. There were 74 books entered in the category. The award will be presented at the end of May in New York City. Berthoin also said she is open to speaking about watershed issues or doing book signings. When a book signing is scheduled, she asks some of the individuals who contributed to the book to attend and read selections of their work. 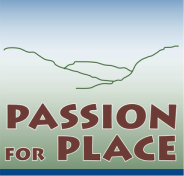 Copies of “Passion for Place: Community Reflections on the Carmel River Watershed” are available at passion4place.net. 9:30am Los Padres Dam, 1:30pm Carmel River at the east end of the River Trail/East Garzas Road, 3:30pm Carmel River Lagoon. Full day $15/adults and youth, Free/children under 12, Free/Carmel River Beach portion only. Visit Facebook page for info on carpools to Los Padres Dam. Come ready to hike with your own lunch and water, journal and good intentions. 915-2706 or 624-9467. Passion for Place Book Launch in the Monterey Herald. 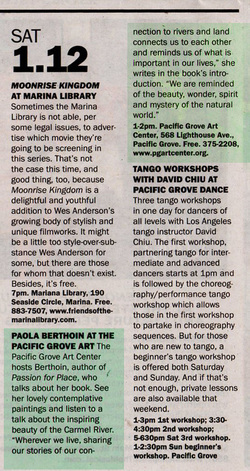 The following article was the feature cover article in the Monterey County Weekly, April 21, 2011. DOWN TO THE RIVER The physical and emotional well-being of the Carmel River Watershed—and those who love it—comes to life in a new, collaborative project. Indeed, the Carmel River watershed holds special meaning to local artists, wildlife enthusiasts, Native Americans and many others who tell their stories in Berthoin’s upcoming book Passion for Place: Community Reflections on the Carmel River Watershed. It’s a collection of stories, essays and poems, along with paintings by Berthoin and an audio CD with interviews and natural sounds from the watershed. Berthoin – and, really, all of Carmel Valley, if not the entire county – has a deep connection to the watershed. Berthoin lives in a home her mother built there in the mid-1970s. It’s her painting studio, and its ponds are a haven for the endangered red-legged frog. The river (along with rainwater from Berthoin’s roof that’s stored in four, 3,000-gallon tanks on her property) feeds the ponds; the artist has worked in some capacity or another to save the watershed for more than a decade. It’s also politically charged. It’s one of our last wild places, where foxes and hawks share pricey real estate with well-heeled environmentalists and those that can afford to build ranchettes and wineries. It doesn’t have its own seat on the Board of Supervisors and the battle between development and open space is regularly fought in court. Plans for subdivisions, shopping centers and even a highway have rallied troops on both sides of the issues. Additionally, the Carmel River, a historic water source for the Monterey Peninsula, is being overpumped. The state has told the water company to stop, but the community can’t agree on a new water supply project. Berthoin’s own history ebbs and flows with that of the river. “It was the summer of 1965 when my mother brought my sisters and me to Carmel Valley from London, England,” begins her story, titled “Connection” in the book. At the time, she was 4 years old. It’s a nostalgic, sensory delight. But development plans lurked, hidden under the hay piled high in fields where the sisters played. Today, the nearly 500-acre property is Carmel Valley Ranch, a golf and tennis resort with a hotel and spa, restaurants and a lounge, that also plays host to weddings and corporate events. It’s an exquisite property, but one that’s far removed from the wild ranchland where Pegus used to gallop. The family moved to Bernwick Canyon at mid-valley in 1974 to Berthoin’s current home. Drive through the suburban Tierra Grande homes, down a steep hill and there it sits on seven acres, flanked on both sides, as Berthoin writes, by native grasses, coast live oak, California sage, coyote brush, sticky monkey and, of course, poison oak. The county moved the historical markers and widened Carmel Valley Road to four lanes in the late ’70s. “Asphalt now seals the lower Berwick canyon floor, a wide concrete sluice for the water drainage, and a road was cut into the hill.” An 8-foot-tall fence closes off the land adjacent to Berthoin’s property. A secretive ring-tail cat appears “like a ghost” in one essay. Esselen, Salinas, Chumash, Mutsen and Cherokee walk in prayer for the river as voters say no new dam in a poem. In another story, thrill seekers navigate the rapids in wetsuits and inner tubes. And a hydrologist sets off to explore the 225-square-mile watershed, hikes into Pine Valley past fields of lupine, black oaks and blue sky and finds a cabin that belongs to a wise old man named Jack English, who invites him inside for tea and shows him his hand-carved violin bows inlaid with abalone. Christensen lives in Monterey and has worked in Carmel Valley since 1995, doing restoration work on the Carmel River for Monterey Peninsula Water Management District. He understands the beauty of the place – and the politics. Sharp was born and raised in Carmel. She graduated from Carmel High School, attended Mills College and then lived on the East Coast for a dozen years before coming back to Carmel in ’81. She now lives in her old childhood home. And in her essay, “Carmel River Lagoon,” she recalls learning to swim, sunny family picnics with Orange Crush. And, over the course of history, we’ve done plenty to help it change, from using it to irrigate crops and then, thousands of years later, golf courses, to damming it, to drawing water off of it through wells and manually breaching the lagoon. Rep. Sam Farr tasked Supervisor Dave Potter with forming a Watershed Council, including representatives from agriculture, hospitality, environmental and residential groups, and educational and cultural organizations, among others. Potter appointed Berthoin as the educational and cultural stakeholder. In 2001, she formed RisingLeaf Watershed Arts (www.risingleaf.org), an intersection of art and sustainability. The nonprofit painted a mural of the Northern Salinas Valley Watershed at Salinas’ Kammann Elementary School, consulted on the school’s landscape design and helped plant three native plant gardens. It sponsored nature study and landscape painting events for kids and families, worked with on-campus student groups, organized art shows and poetry readings and participated in clean-up days. Berthoin had always wanted to hike the entire watershed; en lieu of that, she decided to hike the accessible ridges and peaks and between 2008 and 2009, she painted her Watershed Series, a collection of 30 plus oil paintings from various vantage points. The canvases show her route: Berthoin started at Jacks Peak, looking down on Point Lobos. She traveled along the northern side of the watershed – from her northernmost point, looking down into Pine Valley atop Tasajara Road. She stopped along the way, on the road to Cachagua and the road to Los Padres Dam, to paint, too. She hiked into Garland Park and Kahn Ranch, and painted a couple landscapes near Carmel Valley Ranch, looking toward Rancho San Carlos. From atop Echo Ridge her view stretched over the Bay, and another painting from Palo Corona’s Inspiration Point looks out onto the ocean. Then she moved on to her River Series, some 20 oil paintings of the Carmel River. And on July 12, 2009, as she painted the river running dry, the inspiration for the book came flooding back. In “Passion for Place,” Berthoin’s essay ends on a hopeful note.